Originally I had in mind to make black bread. However, I couldn't find any recipe NOT using long fermented sourdough starters. I'm afraid of sourdough, the longer it needs to ferment the more, despite reading lots of posts with titles like "No Fear of Sourdough!". Then I hit upon this. One of the family members my baking attempts are usually aimed at had recently remarked that he loved seed and nut breads –"the seedier and more nutty the better". 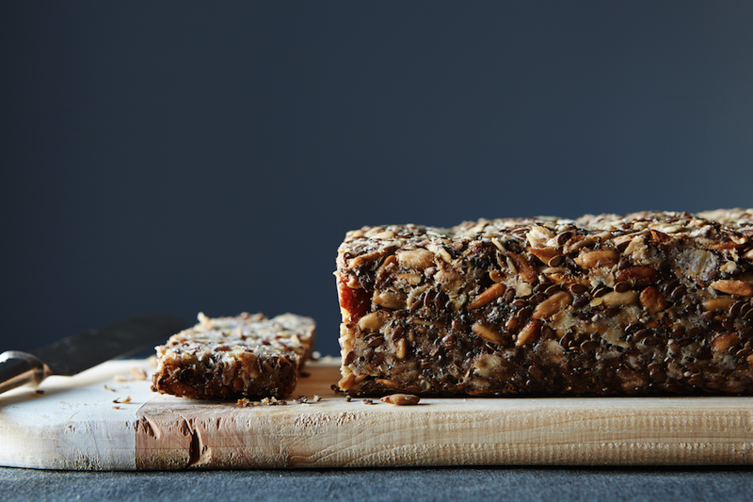 What could be seedier and more nutty than a 100%-seeds-&-nut-loaf? 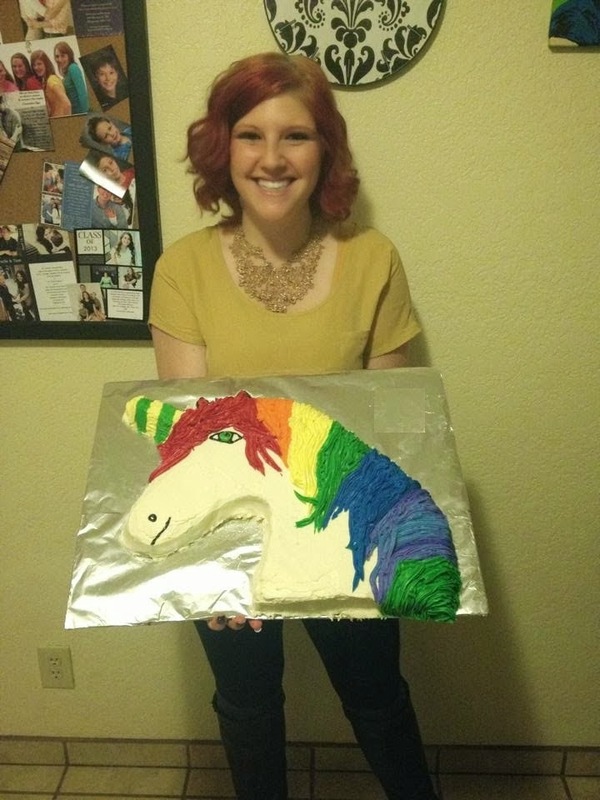 Only the experience of baking it – or trying to. I took a standard loaf pan (of tin instead of silicon but I boldly claim that can't be the reason for the disaster), lined it with parchment and filled in the seed mix. It consisted of the exact same amounts of the exact same ingredients. I did not substitute anything with some unfathomable EU-products and did not mix up metric and US measures. Note, I even got a measuring cup with cups and ounces (okay, I already had the cup but anyway, I did use it) and even bought organic coconut oil for 5 Euros to add those darn 3 tablespoons to the batter! Said batter actually isn't worthy of the name, because it's simply a drippy mix of nuts and seeds, sticky as heck because of the class A maple syrup that goes in it. At that point I didn't worry. After all, the whole mix had to sit for a couple of hours or overnight. I imagined the seeds would swell up and somehow be pressed into a solid shape. The next day I got the first hunch that this wasn't the case. Since I had gone so far there was no turning back. The tin went in the preheated oven and sat there for a good 30 minutes instead of the 20 minutes called for in the recipe, but the cluster was still falling apart. It was sticky, but far from manageable. How far became evident as I transferred it out of the baking tin by lifting the parchment. The outer crust was inseparably glued to the parchment while inside this package everything was rolling (think of holding a water bomb filled with seeds and nuts). Incredibly, I succeeded in turning it onto another sheet of parchment on the oven rack. It went in the oven again, and I was pretty glad to have the approaching failure out of sight. It got back to me. Soon there was a burnt smell in the kitchen. 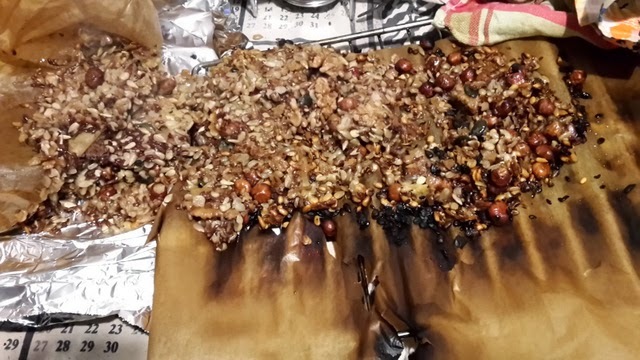 It came partly from the parchment which had caught fire, and partly from nuts and seeds that had fallen off and rolled in the oven's most remote corners. Probably it will be years until the last of these has been removed or burned to ashes. Attempts to separate the burnt parchment from the loaf resulted in the collapse of the loaf itself and the whole baking project. This final stage of decomposition is documented by the photos. On the GCT scale: this gets a 4. Visibly burnt, but not on fire (yet). No one tried the stuff smelling of burnt coconut oil and burnt money. No one will ever try it again. At least not over here in this tiny kitchen of ours. 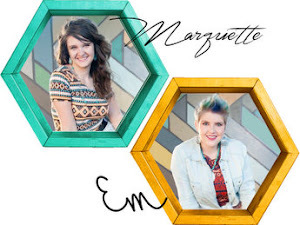 It's time to show you the projects we were sent for March's challenge revolving around Spring! Click on the names of each submitter to be taken to their blogs. I may or may not have pinned it LAST EASTER and forgotten about it for a year. Womp womp. But when I saw it again in the past month while perusing spring-y things to get me out of the winter blahs, I saw it and got excited all over again. Furthermore, with it in mind as I ran errands this week, I was able to put together my own take on it. TA DA! 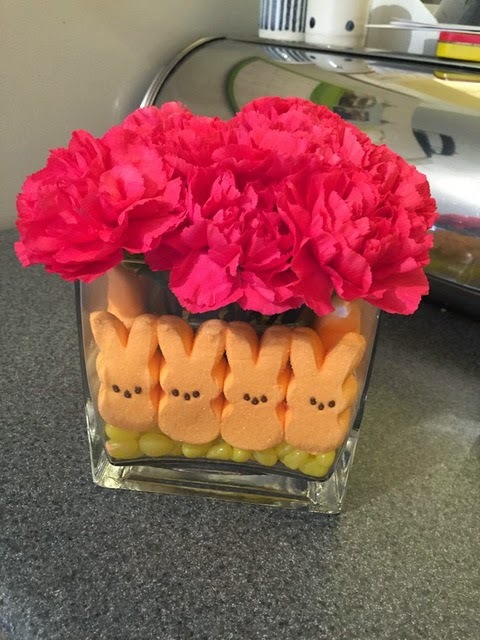 I changed the color of the Peeps because the ones at Target were blind-your-eyeballs pink, and that with pink flowers would be too much for me. I really love pink/orange color combos but never do them in my home, so this was the perfect, temporary way to go with that color combo without any of the commitment. :) As far as the flowers go, Safeway didn't have the crazy Gerber daisies but did have these great carnations in the exact shade of bright, SPRING pink I wanted. Bam! And that's how you bring Spring into your house... a year after pinning it. I'm from Pennsylvania, and it seems that each week brings another peek of spring followed by freezing temperatures and another 6 inches of snow. So out of frustration, I got together with one of my gal pals to have a spring party! We wore bright colors and filled a pin board with ideas. 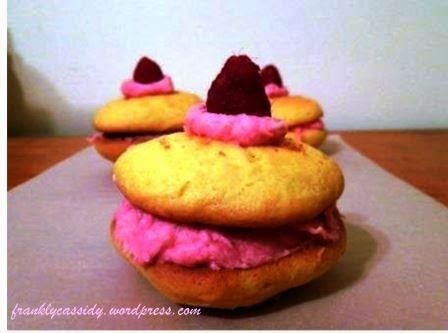 While we pinned about a hundred things, we focused on two pins that turned out beautifully: Lemon raspberry whoopie pies and a lemon-raspberry sugar scrub. The whoopies were inspired by this pin, but we tweaked the cake recipe substantially and followed our own recipe for the filling. 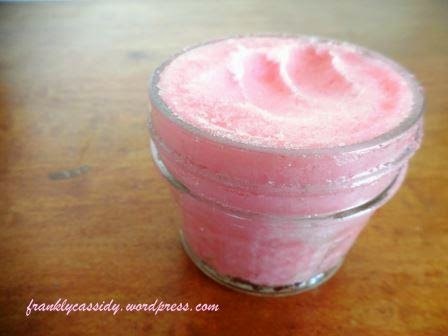 The sugar scrub was an exact following of this pin, and is also amazing! 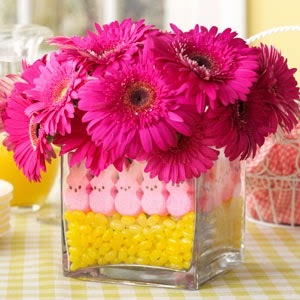 There may still be some patches of snow outside, but both of our spirits were lifted by a taste of spring! My articulated 1990s Stacey (Barbie's younger sister, junior to Skipper) was a major find over Christmas. But she had no clothes... until now. I modified the real-life Starboard skirt pattern to make her a very spring-like Easter outfit. 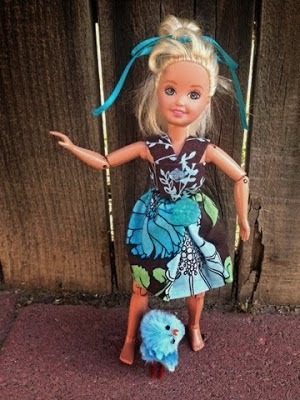 I'm glad the Pinstrosity challenge lit a fire under me to tackle this, as I finally decided that the answer to my sewing frustrations is that in April I'm going to tackle a doll garment every night that I get home at a reasonable hour. That should provide enough practice to get me past the worst terror and confusion! 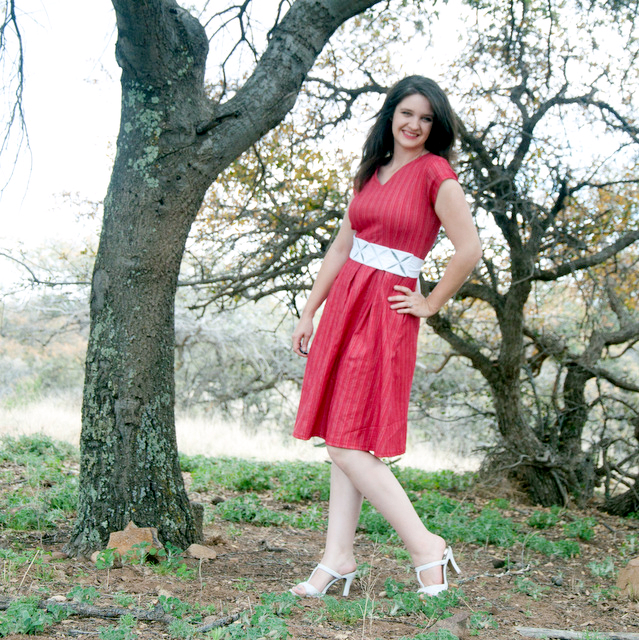 I recently bought me a new Spring/Summer dress and wanted a fun belt to accessorize it with. After going through my boards I found the perfect belt! It was springy and fun and I figured it could go with many of my skirts and dresses to add a touch of spring. It was more of a booger to make than I thought it would be, but I finished it! I wasn't sure I liked it at first, but it's grown on my more and more! As National Craft Month (March) came to a close we were both feeling a little reflective. We mulled over past projects, took a look at our approaches to creativity, and snickered at our goof ups all over again. 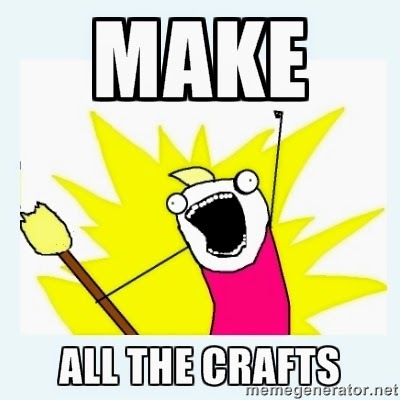 Eventually it boiled down to these thoughts: "Look how far I have come as a crafter! And also at the same time, look at how much growth potential I have!" You might be giggling (*cough cough* rolling on the floor in tears and fits of laughter if you are new here) at this and wondering who in the heck newbie craft rookie made this giant mistake…that would be me, Emilee Goutcher, Crafter Extraordinaire. This was one the first cake creations I ever attempted. It went worse than awful. It looks like a beast from the deepest most forgotten corners of the kitchen from hell. It was hilarious to bring to the party (which I did end up taking by the way), and yet people still ate it! Whether it was pity eating, or because it was actually good is still up for debate. What I really loved though was that it created conversation, it created a safe place for fellow crafters to commiserate at, it created a giggle, sharing of tips and tricks, and it was one of the cool inspirations for this site. ...but that doesn't mean I don’t still make mistakes, laugh, cry, get back up and try again. Even those crafters who have been at it for 50+ years (Mom) still call me frustrated every once in a while, we talk it out, growl at the fabric, make a joke and figure it out. This approach works for us! We've learned so much by all our attempts. We are different crafters now in 2015 than we were in 2012. Not because we took classes on specific crafts. Not because we're gifted at crafting (bahaha, you've seen enough of our projects here on Pinstrosity to know that we're not!). It's because we tried. And tried. And threw away projects (after posting them on here of course). And succeeded here and there. Our craft is crafting, whether we do it well or not, and it's a part of who we are. What we love about crafting is the ability to simultaneously by so stinkin’ impressed with your bad self and also know that next time it will hopefully be easier, better quality and more enjoyable. The fact that our craft can allow for self-recognition of awesomeness while at the same time be a measure of how we can improve next time is unique and fabulous. Why wouldn't we love it?? We love that our craft allows us to create new things that have never been thought of before, but that we can also share those things with others and they can find joy in creating something similar. There is a certain comradery in the craft world that I find admirable. We can see something clever and say to ourselves “Why didn't I think of that? !” which to me is the ultimate craft compliment. We love our craft because it brings us closer together, it brings out our most creative selves, and we might just learn a little here and there all while still burning our fingers on the hot glue gun for the million and eighth time. Goshdangit. Spring is here, and with it it's time for some Spring Cleaning! I just did a major decluttering overhaul on my house and it was so freeing! The hardest place to really thin out though was my craft room. When did I buy all that stuff?! I did get rid of some of it, but there's still plenty more to use up. That gave me the perfect idea for the April challenge. This month we challenge you to try out a Pinterest pin that only takes items you already have on hand! Use up your stash! 4. Email us your pictures, the link to the project you were inspired by, and any bit of the story you want to tell. You have until 8:00 AM (MST) on May 1st to send us your April projects. 5. Saturday, May 2nd we will do a Round Up post and show you the projects we were sent in. If we have too many for one post, we'll do multiple Show and Tell Saturday posts! 6. All projects submitted as part of the challenge need to have been completed in April 2015. No submitting projects you did last year. 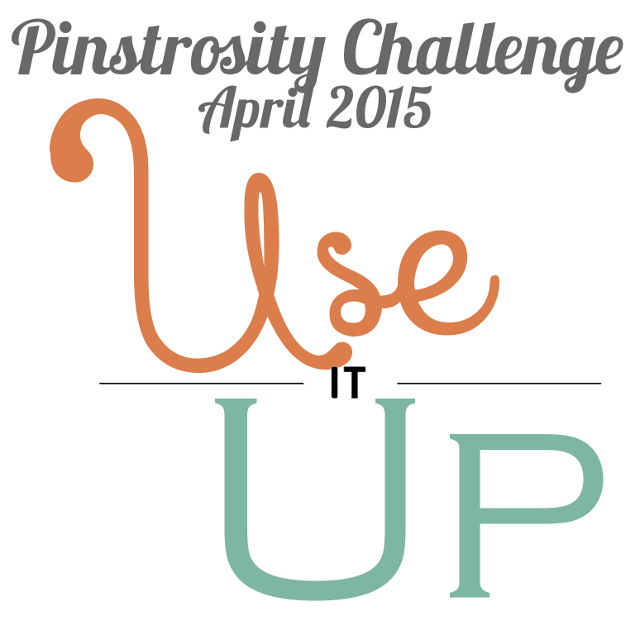 The point of this challenge is to get you to actually use Pinterest to inspire your life!